An oil trading firm has agreed to pay more than $46m (£28m) compensation to people in Ivory Coast who say they were made ill by dumped waste in 2006. Trafigura, with offices in London, Amsterdam and Geneva, said 30,000 people will each receive $1,546 (£950). The money is in addition to the nearly $200m that the company paid the Ivorian government in 2007. Trafigura and the plaintiffs' lawyers agreed that a link between the dumped waste and deaths had not been proved. A joint statement by the company and the British lawyers representing the Ivorians, Leigh Day and Co, said at worst the waste had caused flu-like symptoms. A victims' spokesman has criticised the agreement, saying the compensation was insufficient. "The cost of medication spent over three years goes much beyond that amount," Toxic Waste Victims' Association head Ouattara Aboubabacar told the BBC's Focus on Africa programme. He believes the suffering may be continuing today. Trafigura said it had been completely vindicated by the agreement. However, the company still faces legal action in the Netherlands over the case. The chemical waste was generated by Trafigura and transported to Ivory Coast on a ship called Probo Koala. In August 2006 truckload after truckload of it was dumped at 15 locations around Abidjan, the biggest city in Ivory Coast. In the weeks that followed the dumping, tens of thousands of people reported a range of similar symptoms, including breathing problems, sickness and diarrhoea. 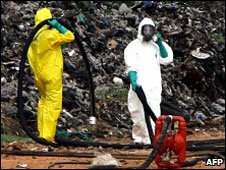 On Wednesday a United Nations report suggested a strong link between at least 15 deaths and toxic waste dumps. The report said there is "strong prima facie evidence that the reported deaths and adverse health consequences are related to the dumping of the waste from the cargo ship". Trafigura criticised the UN report as premature and inaccurate, saying: "We are appalled at the basic lack of balance and analytical rigour reflected in the report." Trafigura has always insisted it was not responsible for the dumping of the waste, as this was carried out by a subcontractor. It also denies that the waste - gasoline residues mixed with caustic washings - could have led to the serious illnesses the residents claim, which include skin burns, bleeding and breathing problems. In 2007 it paid nearly $200m to the Ivorian government to "compensate the victims" among other things. The government-administered fund paid compensation to the families of 16 people whose deaths they believed were caused by the waste.